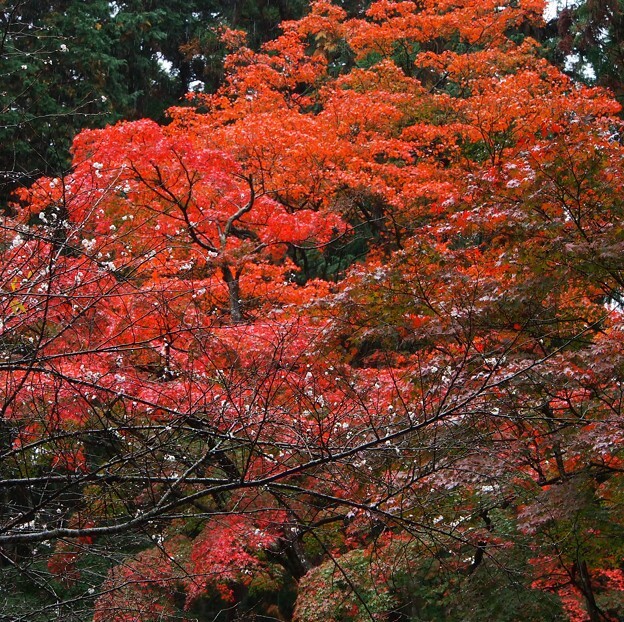 Tanba-shi in Hyogo prefecture is famous for Autumn leaves within the many temples. The Kozan-ji Temple offers a splendid view with a carpet of red Autumn leaves all over the ground. The contrast between the stone lanterns on both sides of the temple and the majestic Autumn leaves is something no one will ever want to miss. Nara Park, one of the most popular tourist attractions in Nara, features the Kasuga Taisha Shrine – a world cultural heritage site. 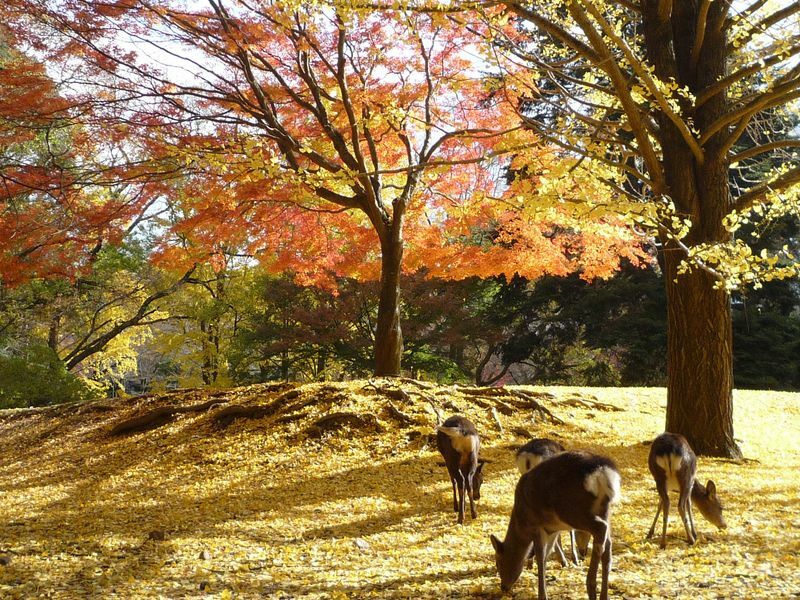 Nara Park has an expansive area that offers its visitors opportunities to enjoy the colors of nature that change from one season to another; from the beautiful cherry blossoms in the spring, and fresh greens in the summer to the brilliant contrasts created by autumn leaves and evergreen trees. Autumn season indeed is in its full glory here. Tofuku-ji Temple in Kyoto is famous for its maple trees referred to as “Tsuten Momiji” including trees with three-pointed leaves. This “Tsuten Momiji” was brought back from Sung Dynasty in China and their best viewing season is from mid-November to early December. Shoren-in is a prestigious temple; the head priest traditionally belonging to the member of the Imperial family. The leaves from maple trees around the Japanese garden change their color and are illuminated in the evenings, in Autumn. The best viewing time is from the end of October to the beginning of December. The temple is conveniently located, 5-minute walk from the Higashiyama Station of the Kyoto Subway Line. 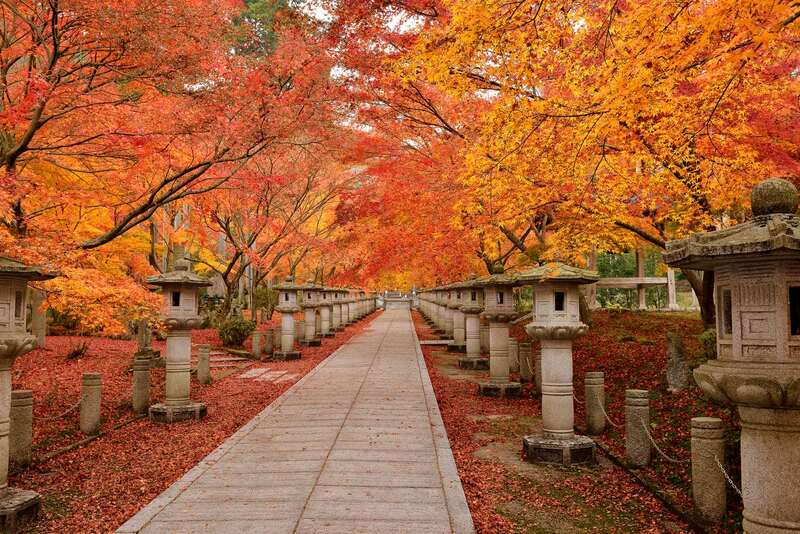 Talking about Kyoto, the famous Autumn leaves in Arashiyama quickly come to mind. This is a must-see area once you are in Kyoto. Togetsu-kyo Bridge is a famous Autumn-leaf viewing spot in Arashiyama, which you do not want to miss, as Autumn leaves viewed from Togetsu-kyo Bridge are the most splendid. The Autumn leaves viewed from Sagano Torokko (a.k.a. Sagano Romantic) train are simply wonderful! At Takao, which is located deep within the mountains, Kawadoko platforms are set-up over the river for Autumn-leaf viewing especially for Autumn. Although it may be somewhat chilly, the Autumn-leaf viewing experience from the Kawadoko is very elegant and lets you acquaint yourself with the many attractions offered by Japan. Koto Sanzan Saimyo-ji Temple in Shiga prefecture is designated as a natural monument by the Shiga prefecture. It is one of the best places in Shiga for enjoying the changing colors of leaves in Autumn. This is one of the three historical temples lying to the East of Lake Biwa and is home to various national treasures and important cultural assets providing a historical charm while enjoying the best views in Autumn. These Autumn-leaf viewing spots in Kansai provide a perfect blend of Japanese history and special hues of Autumn that imprint beautiful sceneries that will last in your memory forever.